If you have applied for a loan lately, a “hassle” would probably be the nicest thing you would say about the process. Everybody likes to blame the lender, and a fair amount of fault does belong to your lender. However, the main problem I see is that borrowers simply tell their banker the deal, email some tax returns in with a personal financial statement, and hope for the best. Let me be very clear – this is the exact opposite of what you need to do. 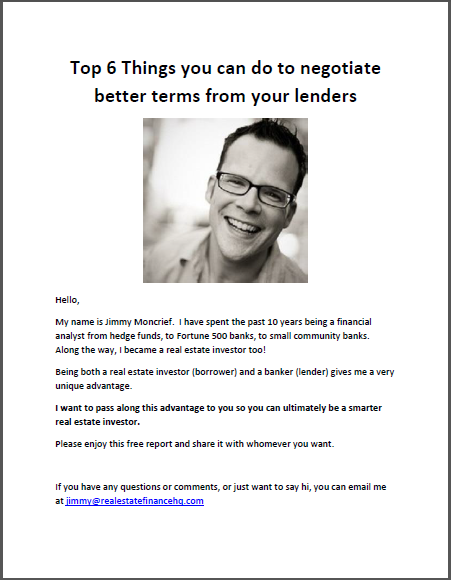 If you want a “Hassle-Free” loan experience, download this Exclusive Report “Top 6 Things You Can Do to Negotiate Better Terms from Banks” for Hassle-Free Cashflow Readers by filling out your contact information above.